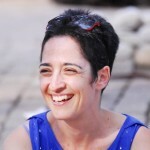 To introduce myself, I am Dalia Shoham Berender. I live in Herzlyah with my husband Loren and my son Nuri. In my profession as a jurist I deal with research and education in initiatives promoting cooperation and equality between Jews and Arabs in Israel and in the Middle East. Music and poetry touch me very deeply. Although from early childhood I sang and played, studied music and performed, I considered music only as a hobby. Recently, I discovered within me a deep connection to poetry, Hebrew and the roots of the language, and to the Reform Movement. I conduct singing groups for women, accompanying prayers and other texts with song and music. I was searching to make this connection more significant and a mutual friend introduced me to Judith, Susie and Gila's project,which I feel blessed to be a part of.